The traditional Scottish dish, haggis, has enjoyed worldwide popularity due to its savory flavor and overall Scottish-ness. Before you indulge, you may find yourself wondering…what is this haggis? Some wild creature of the glens? The elusive wild haggis, Haggis scoticus, is the cryptozoological namesake of the traditional dish. It is a mysterious animal revered by the Scottish, doubted by the English, and hunted by many an eager American tourist. 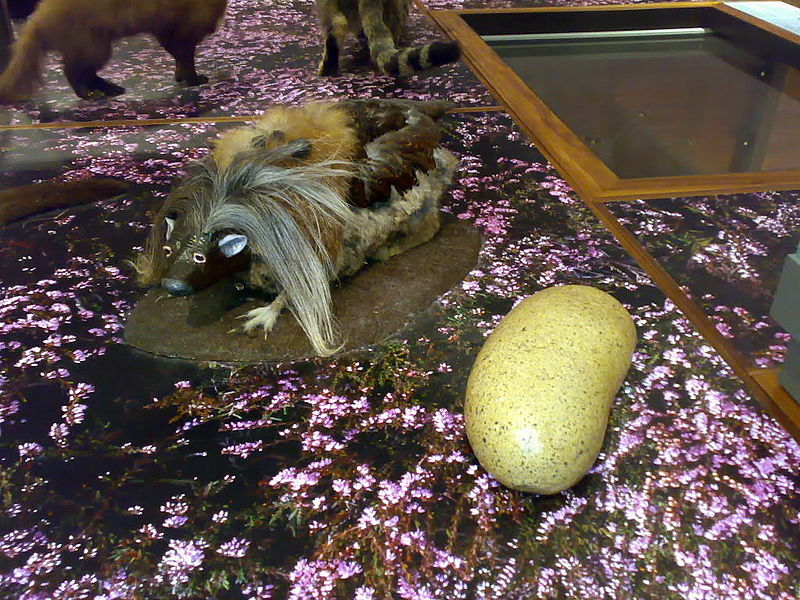 A representation of the wild haggis next to its culinary counterpart. Wild haggii are said to inhabit the Scottish highlands, a landscape to which they are perfectly adapted: the legs on one side of the body are significantly longer than the legs of the otherside. Their ability to maintain balance on the Scottish hills is unparalleled—in one direction. There are actually two subspecies of haggii, known as leftus and ius, named for their dominant leg side. The leftus populations are reported to run clockwise around the hilltops, if seen from above, and the ius runs counterclockwise. Their disparate leg lengths give them a unique advantage in their ability to move, but rather limits their ability to change direction—if a leftus were to attempt a counterclockwise jaunt around the hill, it would promptly roll right down the hill, likely into a bog. This crucial fact of life for the haggis makes inter-subspecies mating nearly impossible and has contributed to their speciation. There have been recent reports that wild haggii have been seen riding the Loch Ness monster, which is fully ridiculous—neither the ius or leftus could keep its balance on such a beast. British disinters have posited that the apparent difference in haggis leg length is due to a predator-avoidance strategy that involves standing in a bog. This is also ridiculous as it completely ignores the deeply ingrained aversion to bogs that haggii have developed in the name of self-preservation. Belief in the wild haggis remains strong, however—33% of American tourists are certain that this creature can be found in Scotland. The true skill of Haggis scoticus is their ability to avoid humans. Unable to catch wild haggis regularly enough to keep up with demand, humans created a substitute haggis for regular consumption. A mix of offal minced with spices and salt, and traditionally simmered in a casing of sheep stomach, haggis is served with “neeps” and “tatties” (turnips and potatoes). Never fear! For those of you that are opposed to eating all animals, mythical or observed, they do have a vegetarian version. If you haven’t tried haggis yet, you’ll have ample opportunity to indulge guilt free while you’re in Scotland for the 3rd International Marine Conservation Congress. Feel free to use your new knowledge about the wild haggis to educate any Americans you encounter—they may have the chance to tromp out on the glens and observe them in their natural habitat! —Brinkley Dinsmore is graduating from George Mason University in May of 2014. She is the Communications intern for IMCC3. Have just been browsing internet for haggis info. I’m called “The Haggis Lady” here in St. John’s NL and I’m interested as to how the world views the lowly haggis. This article is excellent and fun too! I must remember some of the info when people ask me such foolish questions sometimes. It’s all too serious for my liking.